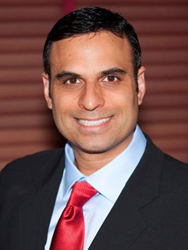 Dr. Amarik Singh was recently named one of America’s Top Periodontists by the Consumers’ Research Council of America. As an experienced periodontist in Oak Brook, IL, Dr. Singh has placed over 14,000 dental implants, including All-on-4® implant supported dentures. The Consumers’ Research Council of America has named Dr. Amarik Singh one of America’s Top Periodontists. Patients searching for a trusted periodontist in Oak Brook, IL who offers cutting-edge services are encouraged to receive a consultation from Dr. Singh at his practice, Periodontal Implant Associates. Dr. Singh offers a wide variety of services including laser dentistry to treat infected teeth, periodontal maintenance and dental implants. The placement of All-on-4® dental implants is one of Dr. Singh’s areas of expertise, and he offers this desirable service as an alternative to standard dentures. Patients looking for a periodontist in Oak Brook, IL who is experienced in the placement of dental implants are invited to find out more about the convenient All-on-4® implant-supported denture procedure from Dr. Singh. Although similar in some ways to traditional dentures, the All-on-4® technique uses a fixed full-arch restoration that is anchored securely to four implants in the mouth. These implants provide a reliable support system that holds the dentures in place so they do not fall out or move around in the mouth. In addition to their convenience and more natural appearance, All-on-4® implants are also a desirable tooth replacement option because they help stimulate the jawbone in the areas where the implants are placed. This helps maintain jawbone health and density in those areas. While individual implants are a good solution for those who have lost only one or a few teeth, the All-on-4® procedure is an ideal solution for those who need full arch restorations due to multiple missing teeth. Patients who have lost teeth due to injuries or gum disease may be good candidates for the procedure and are encouraged to visit with Dr. Singh for a comprehensive consultation at their convenience. Those who would like to learn more about the advantages associated with All-on-4® dental implants are encouraged to call Dr. Singh’s practice at (630) 974-5051 to schedule an appointment. As an experienced periodontist in Oak Brook, IL, Dr. Singh carefully assesses each patient’s unique needs when determining whether or not All-on-4® implants are the right solution for their situation. Periodontal Implant Associates is a periodontal practice offering personalized dental care for patients in Oakbrook Terrace, IL and the Chicago area. After graduating from Northwestern University Dental School, Dr. Amarik Singh went on to obtain his Specialty Certificate in Periodontics and earn his Master’s from Northwestern University. Dr. Singh is deeply committed to continuing education and prides himself on remaining on the cutting-edge of the newest techniques and technology in dentistry. Dr. Singh is part of an elite group of dental professionals at the forefront of the Chao Pinhole® Surgical Technique (PST™), a revolutionary new approach to repairing gum recession. To learn more about the periodontal services available at Periodontal Implant Associates, please visit http://www.pidentists.com or call (630) 686-1030.